Many animals are masters of camouflage. 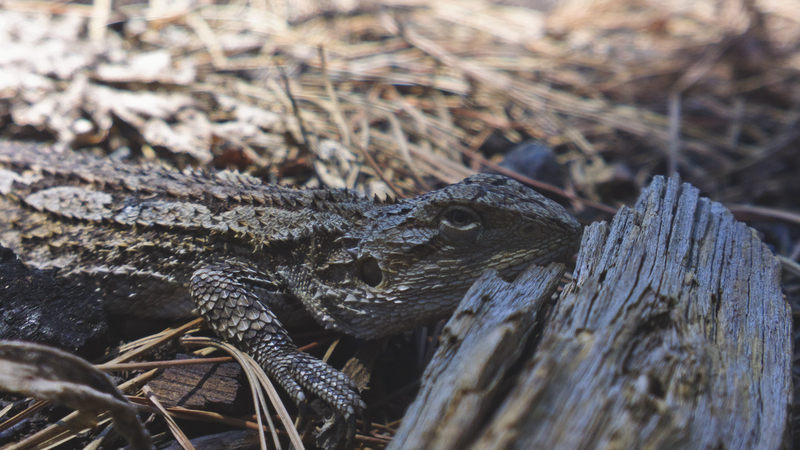 When it comes to protecting themselves, reptiles, birds, insects, and a range of other species are often able to blend in almost seamlessly with their surroundings. Read on to see if you can spot the incredibly well-camouflaged animals in these photographs. Most owls are nocturnal, only hunting for prey under the cover of darkness. During the day, they shield themselves from predators by mimicking the coloration and sometimes even the texture patterns of their surroundings. Can you spot the owl hidden among the branches in the photo below? The leafy sea dragon is typically found along the southern and western coasts of Australia. As its name suggests, the sea creature features long, leaf-like protrusions all over its body. These, along with its small, almost transparent fins, serve as camouflage, making it look simply like floating seaweed (as in the below photo). Good luck spotting this one in ocean water! Chameleons have some of the best-known camouflage skills of any animal. According to LiveScience, they can rapidly change color by adapting a layer of special cells nestled within their skin. The extent of their transformations depends on the species, but the color adjustments can often help them defend territory and attract mates. Take a closer look at the picture below and you’ll see there’s actually an octopus in there. These beautiful creatures use camouflage when hunting and when avoiding predators. To do this, they use specialized skin cells known as chromatophores, which change the appearance of the skin by adjusting color, opacity and reflectivity. Moths use subtle color and pattern changes to blend in with their surroundings, just like the practically invisible one in this photo. They often gravitate to natural structures, like tree bark or leaves, to hide. One 2012 study even found they actively seek out the best positioning to increase invisibility. Pretty clever! How does this guy blend in with this environment so well? Leaf-tailed geckos, which are native to the island of Madagascar, have the ability to replicate the colors of their surroundings, as well as the shapes and vegetation of the forests they live in. They are also able to flatten their bodies against various surfaces, which helps them disguise themselves among dry leaves or the bark of trees. If it weren’t for this one’s eyes you’d probably never be able to spot it in the photo below! Believe it or not, there’s a fish in this picture. You may not see it because, like most of the animals on this list, various species of cuttlefish can generate a wide range of colors and patterns to blend in with their surroundings. By perceiving the color of a backdrop and constricting the right combination of chromatophores, the animal can make itself practically invisible. This is just an ordinary branch on an ordinary plant, right? Actually, that twig-like thing in the center is known as a stick bug. Their natural camouflage makes them difficult for predators to detect among trees. How quickly did you spot the crab in this photo? Probably not right away, which speaks to its amazing camouflaging skills. Decorator crabs, which consist of several different species, ward off predators by adorning themselves with mostly sedentary animals and plants. Pygmy seahorses survive by using their long tails to attach themselves to soft corals or sea fans. They have the extraordinary ability to match their host’s bright color and rough texture. Often, they blend in so seamlessly that even trained scientists have trouble spotting them. The flower in this photo may look lovely from a distance, but hold it up to your face and you’ll get a sneaky surprise. Flower crab spiders can adapt their color to match the flower they’re sitting on. The goldenrod crab spider is the largest and most well-known of the North American flower spiders, typically changing its color between white and yellow. Lizards use a variety of different camouflaging methods. Some select rocks that match their own color to hide on, while others darken their skin to mimic their environment. Depending on the species, these abilities are mostly used for either signaling or hiding from predators. Does this look like an ordinary pile of boulders and rocks to you? Take a second look and see if you can spot the rattlesnake that’s actually hiding in there. These snakes’ ability to blend in with their environment hides them from potential threats but also makes them even more dangerous to the smaller animals they prey upon. That’ll make you think twice next time you see a pile of rocks during a hike! Peacock flounders are sort of a cross between regular flounders, peacocks and chameleons. The fish are known for being masters of camouflage. They use cryptic coloration to avoid being detected by either prey or predators, as pictured below. Butterflies have a range of tricks to shield themselves from predators. Depending on the species, they camouflage themselves by looking like another object or taking on the patterns and colors of nearby trees, rocks or leaves. Like moths, butterflies often remain motionless while resting and spread their wings out in order to better blend in with their surroundings. It might take more than one try to spot the animal in this photo. Stonefish are known for their impressive camouflaging abilities, which make them undetectable to prey, predators and even scuba divers. The creatures are known to sit completely still on the sea floor and perfectly match their colors to their preferred habitat — usually coral or rocky reefs. According to Oceana, they’re also the most venomous fish in the ocean, although they typically only use their venom to turn away predators, as opposed to trapping prey. Another sea creature that really knows how to blend in: the ghost pipefish. There are about five different species of the fish, and all have their methods of disguising themselves. Often, the ghost pipefish aligns itself against a coral reef so it blends in or looks like a piece of algae. Toads often use the muted coloring and bumpy texture of their skin to hide themselves while hunting for insects. Where they disguise themselves depends on the species. Some toads lay camouflaged at the bottom of swamps or ponds, while others blend in with dry wooded environments, like this guy. If you were scrolling quickly through these photos, you’d probably wonder why there was a picture of a brown leaf randomly thrown into the mix. But look again and you’ll spot the beady eyes of a dead leaf mantis. As its name implies, the insect closely resembles foliage — which helps protect it from predators that feed on insects. Wolf spiders are mostly dark-colored, with brown, grey, black and tan skin. According to LiveScience, their coloring makes for effective camouflage, which helps them avoid predators while attacking prey. In addition to blending into their environment, spiders also have excellent night vision, which allows them to effectively hunt in the dark. It’s probably better for all of us that these creatures are difficult to see or most people would never go into the woods! Can you see the reptile surrounded by brown leaves in this photo? Camouflage is also a common defensive mechanism in frogs. Most frogs who use camouflage are nocturnal, seeking out a places to blend into the background and remain undetected during the day. Some frogs, like certain species of tree frogs, have the ability to change color, although it’s typically restricted to a limited range of colors. The rock ptarmigan can be found in rocky mountainsides or tundra across arctic areas of North America, Europe and Asia. This bird seasonally camouflages itself using its plumage; its feathers moult from white in the winter to mottled brown in the spring or summer. The bird below has a brilliant disguise for rocky terrain! It’d be easy to mistake this species of insect for a small green leaf. Their bodies not only match the exact color of most vibrant leaves, they also boast the detailed veins you can often spot on foliage. For that reason, the insects spend most of their time hiding and feeding on leaves on the tops of trees or bushes. Wire coral makes for a suitable home to many different species, including certain kinds of shrimp. The small creatures tend to burrow in the side of the coral for protection. There are at least two forms of shrimp that are believed to only be able to survive by living within the wire coral. The one pictured below is nearly impossible to spot. Grasshoppers are also among the many insects and animals that know how to use their surroundings to hide effectively. Their appearance varies by species, but many feature green and brown coloring to help them camouflage in the plants, grass, weeds and trees on which they live. They also make use of their impressive jumping abilities to escape from or startle predators. Brown creepers are small woodland birds that often move undetected in the forests and trees that they inhabit. As the first part of their unfortunate-sounding name implies, the birds are brown with light spotting, closely resembling the coloring of a piece of tree bark. When hunting for insects to eat, they flatten their bodies and creep along the tree bark slowly before poking their heads in any crevices or holes they may find. Snow leopards usually inhabit steep cliff areas and rocky ravines. They are known for having thick white, yellowish or soft gray coats with black spotting. The patterned fur allows these stealthy animals to become nearly invisible in their natural habitats, hiding them from potential prey and making them notoriously difficult for photographers to capture. They’re beautiful animals but petting one would probably not be recommended. Look closely, and you’ll realize this isn’t just a bunch of sticks — there’s actually a snake in this photo! It’s known as a brown vine snake, recognized by its extremely long and thin body that makes it resemble an ordinary branch. Its coloring can make it very difficult to, especially since these fast-climbing snakes tend to spend most of their time in trees or shrubs. The image below may look just like an ordinary leaf. But if you look really, really closely, you’ll spot a well-camouflaged caterpillar resting on it. The baron caterpillar is a species typically found in India and Southeast Asia that feeds on mango and cashew trees. Nightjars are nocturnal birds that usually only hunt for food in the hours of dusk or dawn. They have mottled grey-brown plumage that makes it especially easy for them to go incognito during the daytime. Their cryptic coloring allows them to easily blend in with leaves or tree bark. SHARE Camouflaged Animals: Can You Find Them?